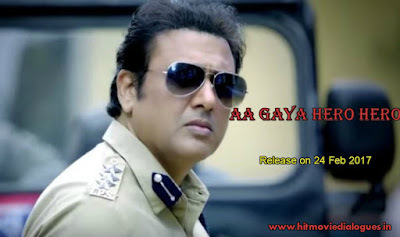 Hello Guys, We sharing beautiful dialogues of Aa Gaya Hero movie. This is an upcoming action movie of Govinda. He is back after long time by this film. This is an action movie directed by Deepankar Senapati and produced himself. He launched the first look, poster and trailer of this film on his own Birthday ans also revealed some details of this film. He is playing the police officer. He is looking fresh as usual and also you can watch some amazing dance moves. The film is going to release on date 24 February 2017. We have already shared some images & wallpapers of Aa Gaya Hero Movie. The fist look and poster of this film has already out. This time we have collected some best dialogues of this film about all popular dialogues are delivered by Govinda. I hope, you will like my post. "Abhi khaakhee mein vo taqat nahi....Ki vo khadi se takra sake"
"Desh chalana hai...toh hath milna padegaa"